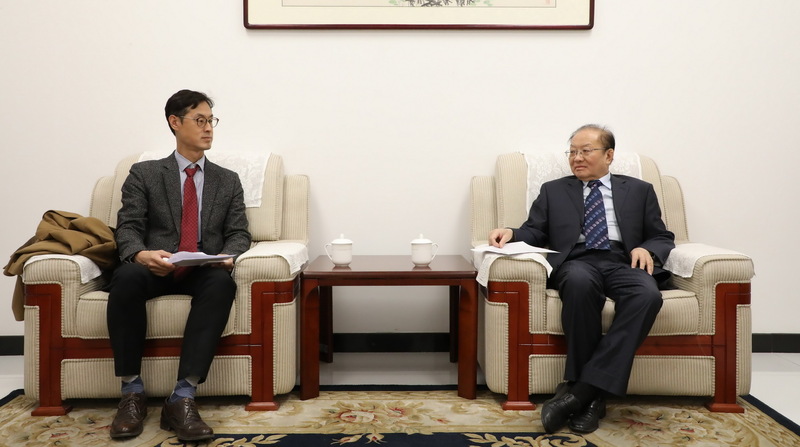 On January 16, 2019, CCIEE Vice Chairman Wei Jianguo met with the Counselor of the Korean Embassy in China, staff from the Department of External Affairs of CCIEE were also present at the meeting. Wei Jianguo said that in the context of the US unilateralism and protectionism, the China-Japan-ROK FTA negotiations should be accelerated to defend the global trading system based on multilateralism. At present, the downward pressure on the global economy continues to increase, but the economic development of China, Japan and Korea can make positive contributions to the Asian and even the world economy. China and South Korea should strengthen cooperation in the process of WTO reform, promote innovation and development of China and South Korea, and the transformation and upgrading of small and medium-sized enterprises, support regional cooperation in Northeast Asia, and jointly promote economic development in China, Korea and Asia as a whole. The counselor of the Korean Embassy said that China and the United States are the first and second largest trading partners of South Korea and the US-China trade friction has a great impact on the Korean economy. He hopes that China and the United States will end the trade war through negotiation as soon as possible. The first round of China-ROK CEO and Former Senior Officials’ Dialogue jointly hosted by CCIEE and the Korea Chamber of Commerce and Industry in June 2018 is a great success, the two sides should give the role of the dialogue into full play so as to build a platform for exchanges between the governments and the business community of the two countries. The two sides agreed to maintain communication and cooperation in the future, and exchanged views on the building of the “Belt and Road” and third-party market cooperation.